This is a joint giveaway cross-posted on Anktangle and Natural Parents Network. You may enter at one site only. Please find the section marked “Win it!” for the mandatory main entry and optional bonus entries. The Harvard Common Press is offering five lucky readers a giveaway of a copy of The Nursing Mother’s Companion, a value of $14.95 each. The Nursing Mother’s Companion, 6th Edition, an accessible and informative guide to breastfeeding for new and expecting mothers. The Nursing Mother’s Companion, 6th Edition, written by Kathleen Huggins, RN, MS, is an excellent basic guide to all things breastfeeding. It provides both general information for the new mother (nutrition, hydration, the benefits of breastfeeding for both mother and baby) and more specific information regarding special circumstances (nursing multiples, moms with diabetes and other health challenges, babies with special needs). 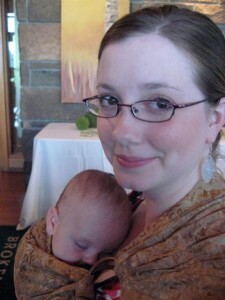 The “Survival Guide” portions of the book address common breastfeeding challenges specific to certain age ranges (the first week; the first two months; months two through six, and months six through twelve). There is an informative chapter which talks about nursing the toddler and revisits the subject of weaning (having introduced it in a previous chapter), and there is a whole section on breast pumps and pumping. The appendices include plenty of breastfeeding-friendly resources, the WHO growth charts for breastfed babies, and also information about the safety of drugs during breastfeeding. I found the information provided in The Nursing Mother’s Companion to be research-based and accurate. For instance, one thing the book strongly recommends is on-cue feeding as opposed to a parent-directed feeding schedule, which we know can result in dehydration, low weight gain, and early weaning. The book addresses myths about co-sleeping and how to ensure you have a safe co-sleeping environment, citing Dr. James McKenna’s extensive research on the topic. I particularly appreciated the section near the beginning (Planning for a Normal Birth) which discussed the impacts that the birth experience can have on the breastfeeding relationship. I also liked that the book tackled the breastmilk vs. formula debate right off the bat, explaining why breastmilk is the best food for human babies to consume. That said, I didn’t experience the book to be particularly anti-formula feeding, especially when it came to the section on weaning the younger (non-toddler) baby. Overall, I thought The Nursing Mother’s Companion was really good. It was an easy read, and it provided a lot of information that would be particularly useful to the mother expecting her first child or the mother who has not breastfed a baby before. For a more experienced breastfeeding mother, some of the sections in the book might not be as helpful. The one thing I didn’t like about the book is that I noticed that there were some companies highlighted in the Resources for Nursing Mothers appendix that are not WHO Code compliant. I wish that the author had paid special attention to that and only included companies in the resource list that choose to follow the WHO Code. Other than that, I found this book to be a great resource for breastfeeding information, and it’s easy to reference if you have a quick question about a breastfeeding challenge you’re dealing with or a medication you might want to take while nursing. I love that The Nursing Mother’s Companion is also available in a Spanish translation (El Libro Esencial para Madres Lactantes). This book would certainly make a great gift to give to any pregnant mother in your life! 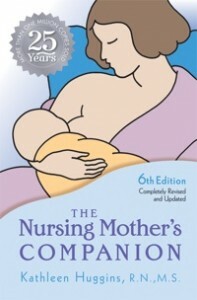 You can purchase your own copy of The Nursing Mother’s Companion at Amazon for $8.95, with free Super Saver Shipping on qualifying orders over $25. For your own chance to win a copy of The Nursing Mother’s Companion from The Harvard Common Press, enter in the comments below. Five lucky winners will receive a copy of The Nursing Mother’s Companion. Contest is open to WORLDWIDE mailing addresses. MANDATORY ENTRY: Tell us why you want to win this book! This is a joint giveaway with Anktangle and Natural Parents Network. You may enter at one site only, and we’ll be recording IP addresses to ensure that there are no duplicate entries. That said, please do visit and enjoy both sites! Tell us who will enjoy your new copy of The Nursing Mother’s Companion. Subscribe to Anktangle in a reader or by email, or follow on Google Friend Connect (1 entry for each). Leave a relevant comment on a non-giveaway article from Anktangle and tell us which post (comment on separate posts for up to 3 entries total). Like The Harvard Common Press on Facebook. Follow @anktangle on Twitter and leave your Twitter name in the comment. Enter another giveaway at Anktangle (1 extra entry per giveaway — check back for more). Put the Anktangle badge on your website or add http://anktangle.com/ to your text blogroll for 2 extra entries each. The HTML code for the badge is on the right sidebar. Leave your site URL in the comment. Contest open to Worldwide mailing addresses. Contestants may enter at either Anktangle or Natural Parents Network but not both. Entries will be combined for the drawing of five winners. We will pick the winners through Random.org after the contest closes and send an email notification. Leave a valid email address as you comment so we can contact you if you win. If we can’t reach a winner or don’t hear back within a couple days, we’ll draw a new name. Entries will be added together from both sites. If there are 50 entries from the non-NPN site and 65 entries from NPN, we will count the non-NPN entries as numbers 1-50 and the NPN entries as numbers 51-115. Contest closes August 30 at 11:59 p.m. Pacific Time. Our reviewer, Amy, writes about the things she holds close to her heart: family, delicious food, and many aspects of natural parenting. She is passionate about natural childbirth, breastfeeding, gentle, intuitive parenting, and respecting all people, no matter how small. She’s figuring it all out as she goes, following her instincts with her son as her guide. Amy writes at Anktangle. I would love a copy of this book because I’m nursing right now (my baby is 17 weeks old). I follow Natural Parents Network via Google Reader. I left a comment on “The Only Child” article. I’d love a copy of the new edition as my copy of the 5th edition is well worn and in need of replacement. I am currently breastfeeding my 8 month old son and hoping to get pregnant again soon so will need to review the section on nursing while pregnant! I am pregnant with my 2nd and I hope to have a good breastfeeding relationship with this baby girl too. I am always looking to read and learn more! I would like to win this book as reference material. I will begin nursing soon. I Subscribe to Natural Parents Network in a google reader. I Follow Anktangle on Google Friend Connect. i have a couple of friends, just having a bAby and choosing to nurse – this would be perfect for a gift. In my main entry I said that I would give it to my friend and his wife, as a gift. Entered the diaper liners giveaway.